Whilst many travellers crave bucket-list travel experiences, from gazing upon the Eiffel Tower to snorkelling over the Great Barrier Reef, others are seeking the unknown. Here, the Meaningful Travel experts at Rickshaw Travel share their top trips guaranteed to offer travellers a different perspective when visiting a destination, from Vietnam to Peru and beyond. Vietnam is known for its famous Pho dishes and tasty Bánh bao buns, but its cuisine is not all it has to offer. The destination – with its natural parks and tropical habitats – is home to a diverse range of wildlife just waiting to be discovered. Where: Cat Tien National Park is the perfect place to spot wild gibbons before exploring the Dao Tien Endangered Primate Species Centre and the Bear and Wild Cat Rescue Station. After learning all about these specialist centres, there is the opportunity to trek deeper into the tropical rainforest for a glimpse of a croc-infested lagoon. How: Rickshaw Travel offers a bite-sized trip Esc-ape to Cat Tien National Park, for two nights and three days. This trip must be combined with at least two other bite-sized trips to create a full itinerary. One of the top bucket-list experiences in the world, the Inca Trail is arguably the most famous trek there is. However, those seeking a more challenging walk should opt for Salkantay route (also known as the “other” Inca Trail). Where: Starting in Soraypampa, travellers will pass small villages and striking scenery by bus, before hiking past mountain settlements to a vantage point with panoramic views over Tucarway Lake to the glacier and beyond. 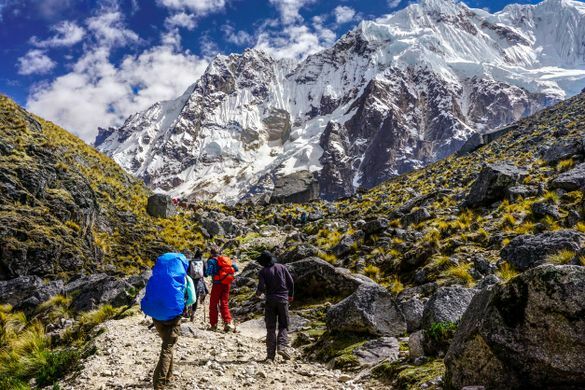 With fewer crowds to contend with, more impressive scenery to behold, and offering a greater physical challenge, the Salkantay trek is a surprising and alternative way to reach Machu Picchu. How: Rickshaw Travel offers a bite-sized trip Salkantay Trek, for three nights four days, starting and ending in Cusco. This trip must be combined with at least two other bite-sized trips to create a full itinerary. *Priced from £725 per person and includes accommodation (based on two people sharing), full board, all transport, camping equipment (excluding sleeping bag) and entrance fees for Maccu Pichu and Huanya Picchu. Most wine-lovers heading to South America will be aware of Argentina’s Mendoza wine region. Famous for its Malbecs, Mendoza regularly draws in large numbers of tourists keen to sample this much loved vino and wander among the vineyards. But, drawing fewer crowds and arguably offering a more authentic experience, the vineyards surrounding Salta offer an equally good opportunity to sample the local grapes, and oenophiles will not be disappointed. Where: Embark on a road trip through the spectacular scenery of Argentina’s high plains, with remote canyons and tiny communities scattered throughout. When in the Cafayate wine region, there’s the chance to visit vineyard after vineyard for a taste of the local grape. How: Rickshaw travel offers a bite-sized trip iSalud! On the Wine route, for two nights three days. This trip must be combined with at least two other bite-sized trips to create a full itinerary. *Priced from £258 per person and includes accommodation (based on two people sharing), breakfast and hire car incl. unlimited mileage per day. Robot cafés, street-side vending machines, illuminated sky-scrapers and late-night karaoke bars; Japan is a feast for travellers craving bright lights and city nights. But what does it have to offer to those in search of some rest and relaxation? Where: Cue Takayama, the perfect rural spot to escape from the bustling cities and take in the picturesque mountain and river views. For travellers looking to make their stay even more relaxing, Takayama also has a wealth of traditional Ryokans with welcoming hosts, and a dose of Japanese charm, making this accommodation type perfect for those seeking a relaxing upgrade. How: Rickshaw Travel offers a bite-sized trip Markets & Mountains of Takayama, for two nights three days. This trip must be combined with at least two other bite-sized trips to create a full itinerary.